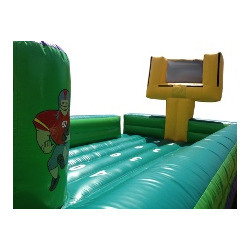 Our Bungee Basketball/Football Combo is like two great inflatable games in one! Weight limit 200lbs per rider Riders should not participate if any of the following apply: a. Past injury to the back or neck. b. Chronic knee or other joint conditions. c. Any respiratory conditions, including but not limited to asthma or bronchitis. d. Any heart or circulatory conditions. e. Pregnancy.